The Bluebird prepaid card from American Express goes on sale this week at Wal-Mart stores. Wal-Mart just rolled back the price of using a prepaid debit card. Starting this week, the new Bluebird card by American Express will be available at 4,000 Wal-Mart stores across the country and online at Bluebird.com. Unlike most prepaid cards, which are loaded with fees, Bluebird can be used fee-free. There’s no activation fee, no monthly fee, no annual fee and no minimum balance. And there’s never an overdraft fee, because you can’t spend more than what’s loaded on the card. Bluebird can be used wherever American Express is accepted. There’s no fee to open a Bluebird account online. For those who don’t want to wait for the card to come in the mail, Wal-Mart stores have a $5 Bluebird set-up kit. You can load between $1 and $500 on a temporary card and use it immediately. Bluebird members can also create and manage up to four sub-accounts for family members, friends or colleagues. The owner of the main account can set spending limits, set up text or email alerts and enable or block ATM access. This would be a simple way for parents to handle a child’s allowance or spending at college. 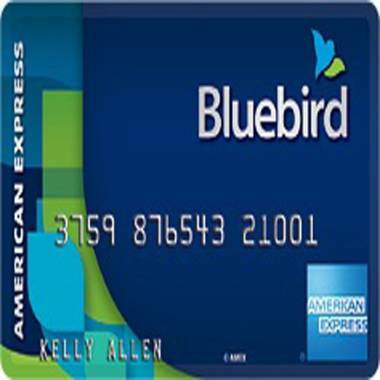 Bluebird also has some of the key features found on the American Express card: Purchase Protection (coverage against accidental damage or theft of eligible items for up to 90 days from purchase), Roadside Assistance, Global Assist Service, 24/7 customer service and fraud protection if the card is lost or stolen. “We want individuals to have another choice in choosing their financial services provider,” explained Laura Kelly, a senior vice president at American Express. Both Wal-Mart and American Express hope people will see Bluebird as more than a prepaid card. Most prepaid cards generate revenue from nuisance fees. A study by the Pew Charitable Trusts released last month found that most prepaid cards on the market have between seven and 15 different fees. The median monthly service fee for the 52 cards in the study was $5.95. American Express hopes to make money with Bluebird by charging merchants a fee to process payment transactions. And of course, Wal-Mart hopes customers will use Bluebird to shop there. With 140 million customer visits to Wal-Mart every week, there’s a tremendous opportunity to get this card into people’s wallets. The website Cardhub.com just named Bluebird “The Best Overall Prepaid Card” on the market today. Card Hub says Bluebird can serve as a free alternative or replacement checking account. Gerri Detweiler, personal finance advisor at Credit.com, called Bluebird “pretty exciting news” for the prepaid card world and for people fed up with ever-increasing bank fees. Bluebird is clearly a positive addition to the prepaid card market and may prove to be a money-saving alternative to a costly checking account for some. Wal-Mart and American Express are to be commended for creating a card that has virtually no fees and that makes it very clear that it will cost $2 to use an ATM if you are not enrolled in direct deposit or use an out-of-network machine. But keep in mind, Bluebird is not the same as a checking account or debit card from a bank. While it’s backed by two giant corporations, this is a financial product that is not federally insured. “I don’t think I would want my paycheck going to a company without FDIC insurance,” cautioned Lauren Saunders with the National Consumer Law Center. It’s also important to realize that this is not a credit card which exposes you to a bit more risk. Federal law provides protection against fraudulent and unauthorized transactions on a credit card but not a prepaid card. Also, like other prepaid cards, Bluebird does nothing to help you build a good credit history or improve your credit score. On the other hand, you can’t get into debt because you can only spend money that’s loaded on the card. Wal-Mart and American Express expect big things from Bluebird. They plan to add additional features in the first quarter of 2013, such as the ability to write checks.